when are your onions ready? Mine didn't get to big the stalk at the biggest is only a inch or less. There about to flower and open. Can I save the seeds? When do I pull them and what's the best way to store them? They are red and yellow onions. Can I leave them in the ground to let them keep growing like garlic or will they rot? Thanks. Cut those flowering stalks off close to the ground and eat it. All parts of the onion plant are edible at any time in its development. There is divided opinions on whether cutting the flower will encourage the plant to make a bigger bulb or not. The best bulbs always come from plants that do not flower and that is for sure. don't mean to hack your post...but have a similar question. I planted sets, and none of them flowered. Some of them seem to be getting bigger and other are kinda leaning over. Do i need to add dirt around the ones that are leaning over? And how long exactly does it take for a onion or mature? Sets are good to not flower if they are small sets about the size of marbles. If sets are larger, they are apt to flower. Any the size of walnuts will flower. 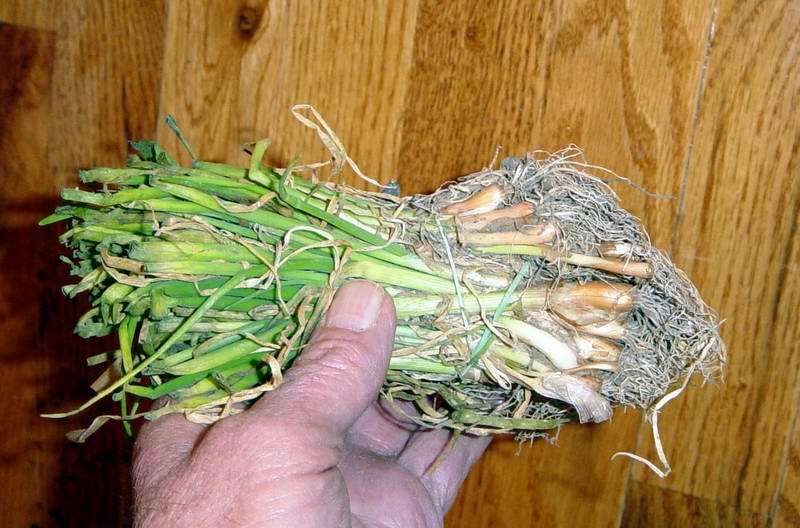 The bunches of little green onions you can sometimes get in garden stores usually grow without flowering. I never add any dirt around them. Just let them do whatever. I plant onion sets in April and mid August I smash the tops down if they haven't already fallen. I like to do that so they will start to dry up and I can harvest around the first of September. So around 120 days for the mature dry onion. When the onion is done growing, the tops fall over and start to dry up. For eating, you can harvest any time, but for storage you need to get those tops drying up pretty good before pulling the bulb, then let them dry some more before storage. thanks that's funny I did some store bought green onions and there flowering also. The little green onions I refer to are about the size of a matchstick. They are often sold at garden stores for planting. Onions are biennial and if they think they are in their second year because of a stop in their progression, they will bloom. Perhaps it has some to do with size too, because it seems the small dry sets don't bloom, but larger ones will even though both are in their second year. Some varieties of onions never bulb and are called bunching onions. They grow like chives. You would never know if that was a green onion you bought in the grocery store. You just have to plant and see what develops. Also there are long day onions for the Northern states and short day onions for the Southern states. If you plant the wrong variety for your locale, you may be disappointed. Save onion seeds? Yes indeed! Last edited by jal_ut on Mon May 07, 2012 4:54 pm, edited 1 time in total. These are small onions grown in Texas and shipped North for planting in northern states. They are of known variety, so you know what you are getting. Starting with these I can get much larger onions than starting from seed in the garden. Yes, I can get bulbs starting from seed in the garden, but for large bulbs this is my answer. I usually plant some sets too. Some gardeners on this forum grow their own onion starts under lights or in a greenhouse. That is a good answer too if you are so inclined. When will onions be ready for harvest? It's Too Soon! I'm Not Ready!